Home Auto Mania Build your own vintage car? 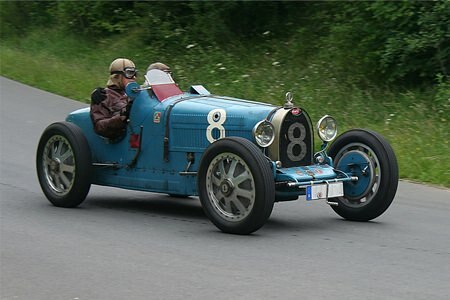 A few years ago I met a very interesting chap with a Bugatti Type 35. He said, “Of the 258 Type 35’s ever built, only 602 are still in existence.” It turned out that these figures were ones he had dreamed up, but apparently there were now so many replicas of the T35B it had even become difficult for the Bugatti Register to keep up with them all. This goes in line with an article in the Detroit News this week reporting that vintage cars have gained in appeal, especially since the financial crunch. Auction values have risen more than sevenfold over the past decade, according to data from market tracker Historica Selecta. British auction house Bonhams, which says global sales total more than $1 billion a year, sold a 1954 Mercedes-Benz F1 car for 19.6 million pounds ($32.1 million) in July, setting a world record at auction. But back to my interesting chap, who was building a Bugatti Type 35. It is not every day you meet people like that, and to make this man even more interesting, it turned out that this was not his first Bugatti. He had already built one T35B, and it had taken 20 years! The Bugatti Type 35 debuted at the French Grand Prix in 1924, where it showed that it was quite capable of speeds in excess of 160 kph. With the addition of a supercharger in 1926 this increased horsepower from 90 to 130 at the rear wheels. 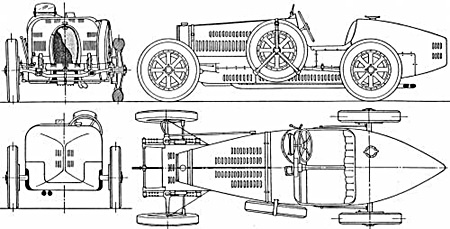 In supercharged form, speeds of up to 190 kph were possible in the 800 kg Type 35B. From a design standpoint, it is regarded among the most strikingly beautiful motors ever built, with its sculptured aluminum block and head, not to mention the engine-turned finish carried over onto the firewall. Now before I get to the Thailand car, which by the way is a recreation, and not a replica, here are some details from another ‘Bugatti’ builder. Leonidas Jorge Anadón operates a tiny company known as Pur Sang (Pure Blood, the Bugatti nickname) situated in Villa Lola, a cottage complex in Entre Rios. Argentina has long been regarded as a font of great enthusiasm for the golden era of motor racing, as well as an impressive resource of artisanship. Pur Sang has been building high-quality, impressively faithful Bugatti T35 replicas for nearly 20 years. The company is also a leading fabricator of replacement parts for owners of original Bugattis, even replicating many proprietary tools. Pur Sang’s Type 35 recreation is visually and dimensionally identical to the original cars, handcrafted and precision-built with over 3000 components manufactured from scratch. Fabrication usually takes up to six months. And now to the local car(s). He has the most comprehensive engineering drawings for his beloved T35B. The complete plans were collected over a number of years, from sources all over the world, but these plans are now enough for him to be able to fabricate parts, absolutely and faithfully to the dimensions as used to produce the T35B in 1924. Even the chassis rails can be reproduced faithfully to the original dimensions. For his first Bugatti, he cut out the rails by hand, carefully following the original dimensions. What also must be remembered is that these Bugatti’s were also hand built, and the minor imperfections were just part of the finished package. However, with laser cutting now being possible in Thailand, he has used a local engineering company to cut the rails. “I save so much time,” he said, and he is quite confident that this new T35B will be finished in three years! I mentioned the engine-turned bulkheads/dash. These days it is possible to produce the geometric pattern exactly, but that takes away the original spirit of the cars, for someone like our builder. Done by hand originally, he has done his by hand as well. Absolute geometric exactness is not there, but this adds to the ‘humanity’ of the car – and the builder. However, there are many parts which were not fabricated by Bugatti, but were cast in alloy, such as the engine block and the differential and magneto housing. He did not comb the globe for secondhand parts (which would be by now over 80 years old) but sat down and manufactured the wooden patterns from the original engineering drawings so the alloy parts could be cast, just as the originals were cast. His patterns are so faithful that he found he was inundated with requests for the magneto housing, a particularly difficult item to source. So as a sideline business he makes magneto housings to order. But like Ettore’s factory, there are parts of T35B everywhere, and the mind boggles at the inventory system, until you find there isn’t one. He just knows where everything is – tucked away under the firewall against the wall, or in the second shelf down, or in a box of assorted parts beside the milling machine and lathe. Important details such as instruments cannot be found these days, so he buys up any ‘period’ instruments, makes new faces and carefully coaxes them back to life. Jaeger? There were three different Jaeger tachometers according him, depending upon the country of origin. And the tachometers, being chronometric, need the tacho drive with the correct ratio to work for the straight eight engine. Try finding, or making, that little item. Fortunately the volume MG T series sports cars also had chronometric tachs, and drives from these can be modified. So how do you value cars such as this? Not original in one sense, but faithfully recreated in the original manner. The jury is out on this one! What do you feel?